In recognition of Earth Day, celebrated on April 22nd, Clark the Mountain Beaver is offering a FREE Coloring Book with each book purchased. Not only can your child read about Clark’s Big Adventure, they can be part of the adventure by coloring their own world for Clark in Clark the Mountain Beaver and His New Friends Coloring Book! 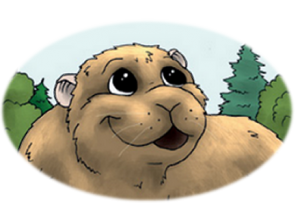 Clark the Mountain Beaver and His Big Adventure ($19.95) is the first children’s book to feature the shy and secretive Mountain Beaver as its primary character. Throughout Clark’s adventure, kids will meet new friends and discover fun facts about animals, and most importantly, learn about friendship, trust and believing in yourself. A wonderful children’s book that has a positive uplifting message even adults will appreciate (visit clarkthemountainbeaver.com to learn more). In addition to a FREE Coloring Book, Clark will donate $1 from each book purchased to the National Park Foundation. With this being the 100th Anniversary of our National Parks, it only seems fitting to join in the celebration.